Taxes include interest and penalty also, but we will discuss about taxes paid by the assesse or taxes deducted from the income of the assesse alone. · Tax Deducted at Source: When the person responsible to pay any income to the any other person, and when the person who is responsible to pay the income, pays the income after deducting the tax thereon, such tax deducted will be known as Tax Deducted at source. In this, the person who is paying the income is liable to deduct TDS, and if doesn’t deduct TDS he will be liable for non deduction of TDS. The person from whose income the TDS is to be deducted is in no situation can be held responsible for the non deduction of TDS liability. 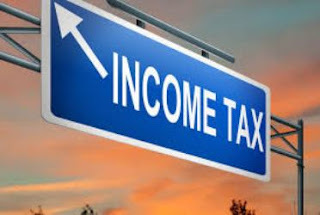 · Advance Tax: If the tax payable by the person for the financial year exceeds Rs 10000 he is liable to pay his tax liability to pay Advance Tax. · Self Assessment Tax: Self Assessment tax means any balance tax paid by the assessee on the assessed income after taking into account the TDS and Advance tax before filing the Return of income. Advance Tax shall be payable in accordance with the provisions, only if the provisions are applicable to the assesse. Assesse himself is liable to pay self assessment tax to the credit of Central Government. So in case of any failure to do so, he will be liable for interest and penalties. 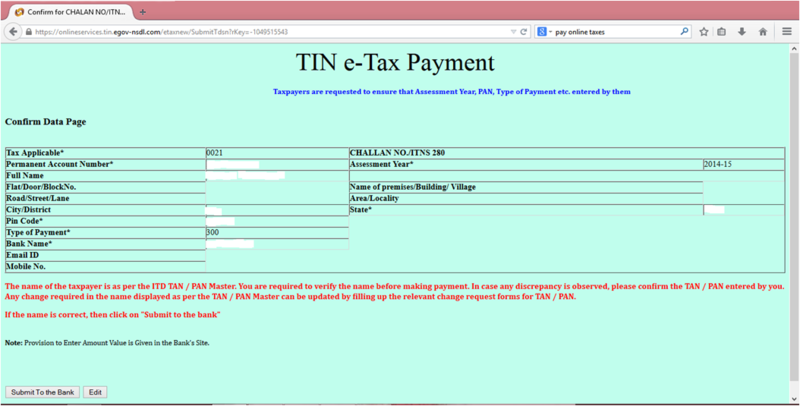 An assesses can make E payment of taxes also from the account of other person. The challan must indicate the PAN of the assesses for whom payment is made. Step 3: Seclect Tax Applicable : Income tax on companies for companies or other than companies for others. Fill required details in the Sheet, PAN, Address, Advance Tax or Self Assessment Tax, then fill the bank name and special character. Then click proceed. 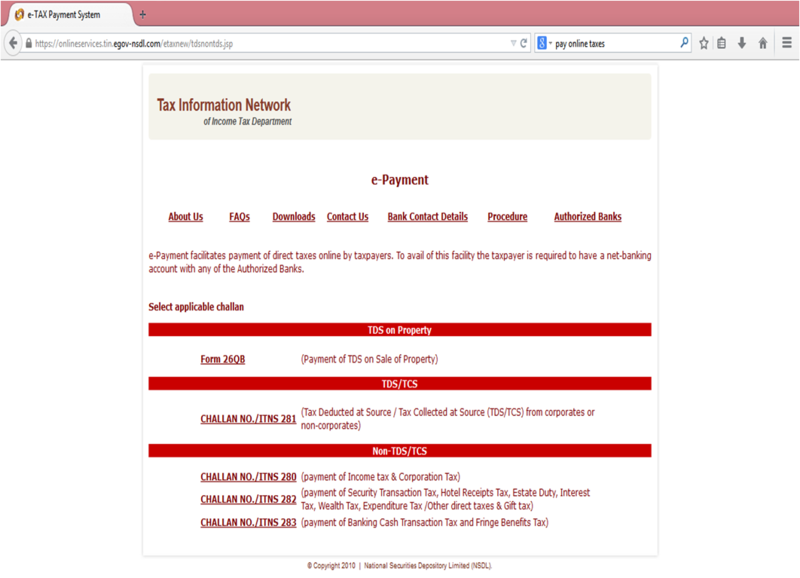 Step 6: After paying online receipt will generate, which shows the date, amount, and time of payment of tax along with Challan No.